John Paul Strain Hand Signed and Numbered Limited Edition Canvas Giclee:"The Northern Lights"
Image Size: 24" x 32.5 and 29.5" x 40"
Edition: Signed and Numbered Giclee - edition of 185 Canvas editions. About the Art: General Robert E. Lee had a reason for hope at the end of 1862. The Battle of Fredericksburg had given the Confederacy a greatly needed victory. On December 13th, General Ambrose Burnside had thrown repeated attacks against Lee's impenetrable line on Mayre's Heights. In ponderous, deliberate waves, the Union troops had charged across a plain and into Southern shot and shell. Casualties were so heavy that the dead lay in heaps in front of the stone wall at the base of the heights. 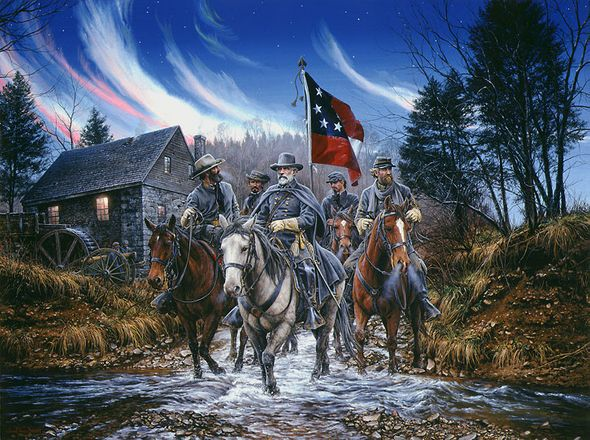 Burnside's troops had limited success against Stonewall Jackson's Corps, but were quickly repulsed. Clear days and freezing nights followed, and the field echoed with the pitiful cries of the wounded stranded between the lines. By nightfall on December 14, General Burnside had decided to withdraw his army from the plain and back to Fredericksburg. It was an evening few on either side would soon forget. As Lee's soldiers worked on improving their defenses, Union troops slowly carried the wounded and dying from the field. At nightfall, the toil of both armies was suddenly illuminated by a celestial phenomenon - the Northern Lights - which cast the Virginia countryside in an unearthly glow. Few men from the deep South had ever seen the Northern Lights, and most stared in wonderment. Was this fantastic display a sign of Confederate triumph? General Lee and his staff rode along Telegraph Road past Howison's Mill, where his reserves had gathered before going to Marye's Heights. The frigid water of Hazel Run cooled the riders while Lee, deep in thought, focused on tomorrow. The night's chill and splendid display did not distract Lee form his preparation for another day of battle. "I wanted to capture that incredible moment in time when the Northern Lights left its memory forever in the soldiers who fought at Fredericksburg. While doing the research for the painting, I found that the location of Hazel Run has changed over the years. The small stream now flows more closely to Mayre's Heights. With the help of historian Noel Harrison, the location of the Howison Mill site was determined. I'm excited to be able to bring this part of American history to life." -J.P.S. No thank you, I just want the 24x32 unframed Canvas.